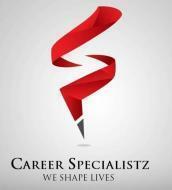 Career Specialistz is one of the leading name in Training and Abroad Education in the city of Bhopal. Weather you are looking for a masters program from Abroad or gearing up for a job hunt in India or maybe simple need a friendly advise on your future Career Options, Career Specialistz is the right destination for you to visit. Our expert in-house counselors have years of experience in providing the right guidance to the students from varied fields and academic backgrounds. Our services are custom-made according to your needs and we believe in providing you with the right information and equipping you with the correct set of tools, so that you face your future career challenges with confidence. Career conducts classes in IELTS Coaching. It is located in Bhopal, Bhopal. It takes Regular Classes- at the Institute and Online Classes- via online medium.